While La La Land is set in the present, its soul is set in a long-gone era. That being the era when movie musicals were always to be found in theaters. Writer/director Damien Chazelle who did the same double-duty on Whiplash and wrote Grand Piano may not create a revival of the genre, but this is the best musical film of this century thus far. It is the story of two dreamers whose pursuit of those dreams bring them together in Los Angeles. “Mia” (Emma Stone) left college and moved to Southern California to pursue her life-long passion of acting. She puts a roof over her head by working as a barista in a cafe on the Warner Brothers studio lot. “Sebastian” (Ryan Gosling) is a pianist whose love for jazz music borders on obsession. His dream is to open his own nightspot where jazz musicians can play whatever they wish to play before adoring aficionados of that type of music. 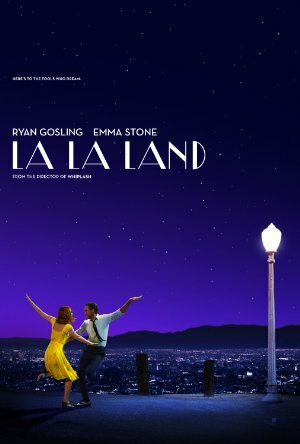 Opening with a powerful song/dance number set on a very crowded freeway interchange, La La Land brings its dreamers together for the first time with a unique “meet-cute.” At that moment, Sebastian isn’t interested in dating or much of anything other than finding a gig where he can play the music he wants to play. J. K. Simmons, who won an Oscar for Best Supporting Actor in Chazelle’s Whiplash, give Sebastian another chance to play muzak-like piano to entertain diners in his restaurant, which brings the couple together again through unusual circumstance. Once the pair are actually a couple, things start to change. Mia decides to write and put on her own one-woman play. Sebastian decides to give “Keith” (John Legend) another chance in spite of their past, and joins Keith’s music group. They play jazz but with a decidedly modern twist. When Sebastian goes on the road to tour the group’s album, things between the lovers are strained. While it is clear that the dreamers will realize their individual dreams, will they reach those goals as a couple, or as individuals? Chazelle’s choices are near-perfection in everything. From the incredible vistas in the hills that overlook the city, through use of the famed Griffith Observatory as a backdrop, to the songs and their singers; everything and anything you see and hear is like candy long-denied to a diabetic audience. Ryan Gosling and Emma Stone have an interesting dynamic as a duo. They may not be traditional Broadway song and dance folk but they do well in their joint and separate numbers. The music sets the tone throughout, as the lovers ride the roller-coaster that love can be, especially between those chasing long-held desires. The final act contains a look at their futures from two perspectives, the reality and what might have been that brings about a fitting ending to a film about lovers and dreamers. I can’t wait to see this again. Plot: A jazz pianist falls for an aspiring actress in Los Angeles.